Provision of technical assistance to community, national, regional, and other organizations in the design and implementation of studies, projects, and programs in environmental management and sustainable development. The program of work is shaped not only by FDPI’s purpose, but also the development realities of the Caribbean. Caribbean economies are essentially single-sector economies, beset by structural deficiencies and extremely vulnerable to external shocks. Attempts to diversify national economies have resulted in limited success, and high levels of public indebtedness and degrading social and environmental conditions create uncertainties about the future. FDPI collaborates with institutions in the public, private, and civil society sectors, and find appropriate ways to engage the general public. However, FDPI’s role is not limited to adding value to programs designed and managed by other institutions. 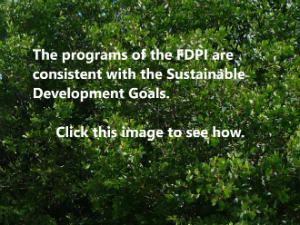 Concerns regarding the utility of current development models, the existence of governance systems that constrain full participation in the development process, and the low level of public confidence in the future, may require the FDPI to become engaged in areas or processes that are not in the mainstream of national or regional development planning in the Caribbean. The problem of inadequate water for domestic and agricultural purposes has been a major issue in Caribbean development. Decreased availability of surface water, increasing contamination of surface and groundwater sources, and increased total demand, have resulted in increased investment in desalination plants and a progression towards the use of deep wells. The concerns about water stresses in the Caribbean motivated Caribbean countries to join the Global Water Partnership (GWP). The GWP-Caribbean (a regional network of institutions involved in integrated water resources management) was launched in 2004. However, the search continues for models of water resources management that can adequately address the increasing levels of water stress. The forecasted changes in precipitation influenced by global climate change bring greater urgency to the need for countries to mainstream integrated water resources management strategies. – Integrated water resources management policy and planning. – Development of appropriate technologies and practices. Caribbean economies are primarily single-sector economies, mostly dependent on, and vulnerable to, external economic forces and natural disasters. Economic strategies have become focused on short-term outcomes, often articulated as medium term economic strategies. It has been stated that economic development models used in the Caribbean have failed to deliver the anticipated outcomes, and that new models are required. Additionally, the various science and technology councils and research institutions in Caribbean countries have not delivered the degree of economic impact anticipated by their founders and stakeholders. There is no consistent testing and demonstration of sustainable development strategies in the Caribbean, as the various analytical tools and approaches used have been largely influenced by external actors. The anticipated changes associated with global climate change require renewed focus not only on adoption of appropriate development strategies, but also on the supporting structures for management of the development process. – National and sectoral development planning. – Mainstreaming environmental management in the development process. – Development and adaptation of appropriate technologies to support transformation of key economic sectors. – Governance arrangements that facilitate collective decision making in the development planning and resource allocation processes. Decisions regarding public sector development strategies and major investments are often made using tools and information not apparent to the communities affected by those decisions. This often leads to waste, social conflicts, and failed projects. The same is often true of private sector decision making in the Caribbean. This program area supports the development and adaptation of standard methods and innovative tools to support decision making in the development planning and development control processes. – Information management and delivery systems. – Establishment of a digital library. – Establishment of an FDPI publications program. – Development of environmental management conceptual frameworks, systems, and management tools. – Demonstration of sustainable development concepts and strategies. – Public policy analysis and development.